Japanesque play a wide range of classical and traditional Japanese music. Japanesque comprises three musicians playing traditional Japanese instruments including koto and shamisen (stringed instruments) and shakuhachi (bamboo flute) accompanied by cello, flute and vocals. Japanesque play a wide range of classical and traditional Japanese music. Rié Yanagisawa is the best known Japanese instrumentalist living in Britain. Her father was a professional Japanese singer, and Rié has studied the koto since the age of eight. Since settling in London she has performed and given workshops all over Europe, including venues such as the Royal Albert Hall and St John’s Smith Square. 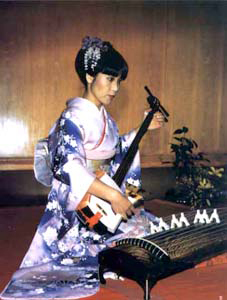 Rié plays shamisen, koto and sings. Clive Bell is a musician and composer specialising in Far Eastern music. He studied the shakuhachi in Tokyo with Kohachiro Miyata. He has played live on Radio 3’s Late Junction, and worked with Jah Wobble, Complicite Theatre, the BBC Singers, and the BBC Symphony Orchestra. Clive’s solo shakuhachi CD was reissued on the ARC label in 2005. He also writes for The Wire magazine. Cellist Stuart Jones was a member of seminal electronics group Gentle Fire, touring internationally and working with John Cage and Karlheinz Stockhausen. He now composes and teaches at the London College of Communication. Japanesque can perform in traditional Japanese costume and Rié and Clive can also perform as a duo. They are also able to perform acoustically where required and appropriate. They can also expand into Haru Ichiban, which adds a classical dancer (with white face and full Geisha costume). She performs three pieces and between her appearances the musicians continue to play. If requested they can explain the scenes and music.